There was a bit of controversy when this concept was launched: a series told - mostly - from the point of a serial killer. To make him palatable to a general audience, he of course adheres to a sort of moral code, only killing 'bad guys'. But it is clear that Dexter is not a well person, in the grip of urges he can't repress, which he has just managed to channel into something semi-defensible. Dexter narrates his thoughts and motivations, though it is not clear to whom. Maybe someday the finale will reveal the answer to that question. Without this device the series would be lost though, as Dexter cannot share his real self with anyone around him: his colleagues at the Miami police - yes, he works in law enforcement - his sister or his girlfriend. He only has the viewers to really talk to and he does this with irony and detachment. I am not sure if the books that spawned him - three so far - are written in the same tone. I also don't know how similar the plots are to the series, as I haven't read them (yet). A friend informed me that they are an 'okay' read and give more insight into the main character. In any case, the writers for the series manage to keep Dexter on the knife-edge between sympathetic and psychopathic. The internal struggle between his humane side and his monstrous side is what drives the narrative. He tries to build a normal life with his girlfriend and her kids, all the while conscious that they would run in terror if they knew who he really was. The possibility that he will be caught and exposed is ever-present. In the two seasons so far, his past has been uncovered, serving as an explanation - in part - for him being the man he is. 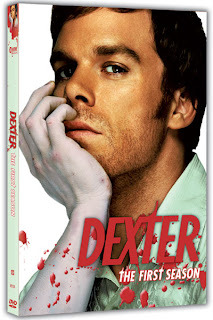 Season one was driven by the appearance of a mysterious rival serial killer with a disturbing connection to Dexter, in the second one the discovery of a couple of Dexter's victims set the law hot on his trail. I will be curious to see where the next season goes and will be holding my breath, hoping they won't screw it up or milk the formula for too long. As it stands, Dexter is a very tense, dark series with a sly sense of humour that doesn't have an equal on television at the moment. If you don't mind some blood, gore and moral queasiness, check it out.